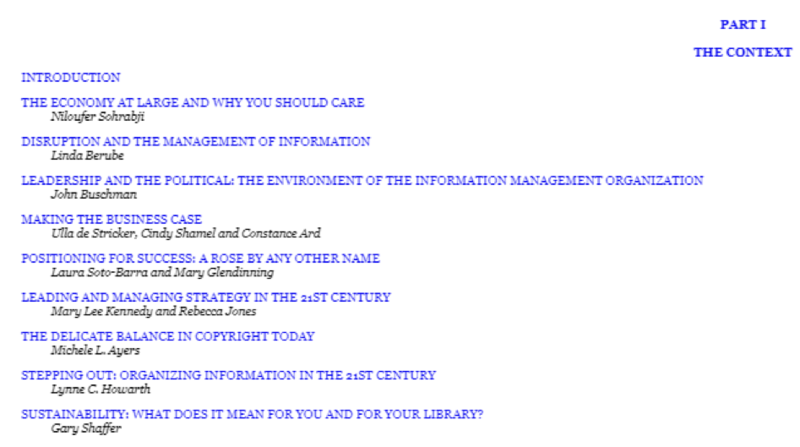 K & IM Refer: the journal of the Knowledge and Information Management Group of the Chartered Institute of Library and Information Professionals (CILIP), is published three times a year and distributed free to members of the Group. This year, the Knowledge and Information Management Group made five awards to either people or resources within our fields of interest. The Walford Award and the Information Resources Awards have a long history, going back as far as 1970s and 1990s. 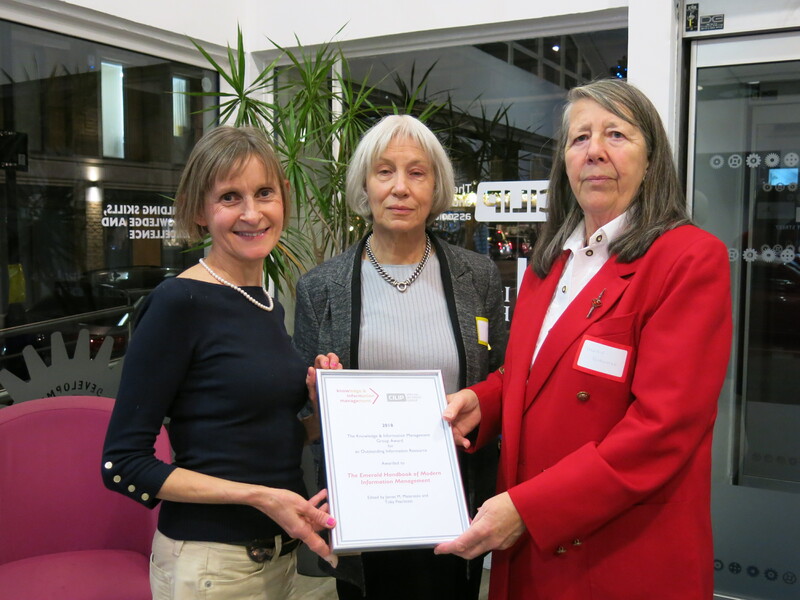 The K&IM Information Award, on the other hand, is completely new and the K&IM and UKeIG Information Manager of the Year is also new, and a welcome collaboration between two CILIP Special Information Groups. Through these awards we hope to show the advantages of professional knowledge management and professional information management, and to help our members deliver high quality and respected services. 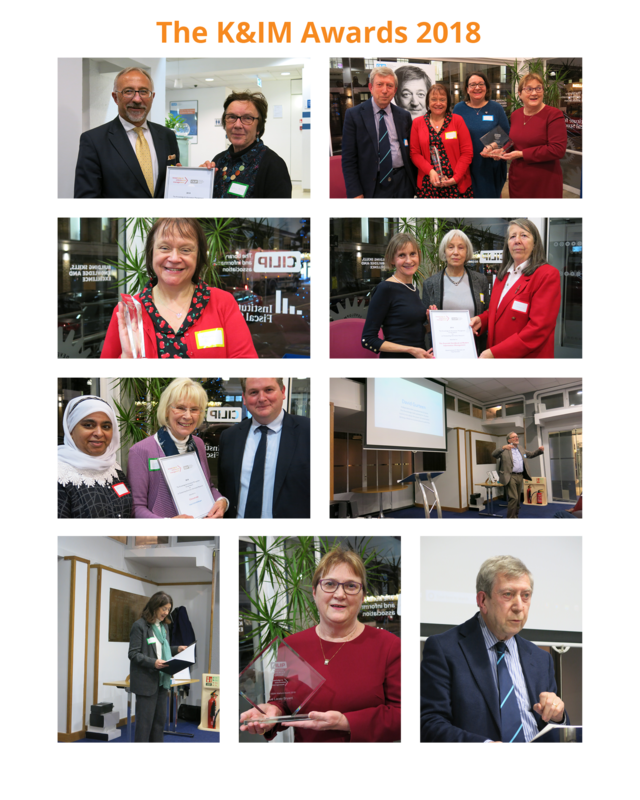 The K&IM Information Resources Awardsare given to outstanding information resources, either in print or electronic format, that are currently available and have a recognisable relevance and importance to the knowledge, information management, library and information sectors. This year we received the largest number of nominations for the Walford Award ever. The award is given to an individual who has made an outstanding contribution to knowledge management and information management. We were looking for a forward thinker, an advocate for the profession, a practitioner’s practitioner and a genuine role model. We quickly saw that Sue Lacey Bryantfitted all of these criteria. As Senior Advisor at Health Education England, Sue has been the driving force behind the transformation of NHS funded library and knowledge services, shaping the vision of Knowledge for Healthcare working tirelessly to implement the change in behaviours and practice to enable information professionals to understand and fulfil their business-critical role in knowledge management. Long before the term “knowledge broker” was popularised, Sue was working in such a role and writing extensively about the difference this role made to healthcare professionals. Ever at the forefront of innovation she embraced the emerging use of the internet within healthcare and developed and launched e-bulletins on the hugely successful Doctors.net. She started one of the first telephone health support lines and was responsible for developing a primary care and public health librarian support programme for the online National Library of Health. An interest in innovation continues in her current role as programme manager for the independent Topol Review where the impact upon the health workforce of new technologies in healthcare such as AI, robotics and genomics is examined. 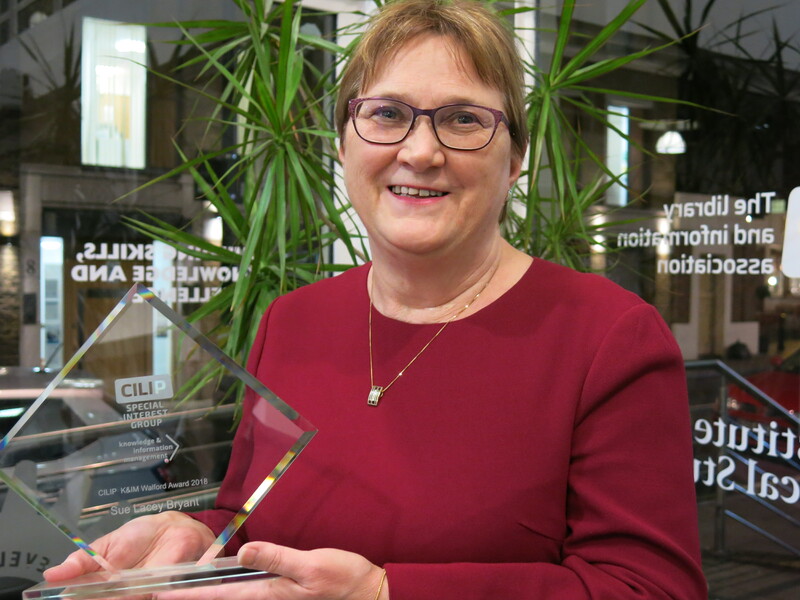 Sue has inspired a generation of health information professionals to broaden their remit beyond the walls of the traditional library and to take knowledge services to the bedside and the board room, working in embedded roles, producing synthesised and summarised evidence bulletins and facilitating knowledge exchange. Raising the profile of health information services, she has advocated the essential role played by information professionals. As Senior Advisor, Knowledge for Healthcare, Sue has been at the forefront of developing a policy a policy for NHS Library and Knowledge Services in England and delivering the high-level #AMillionDecisions campaign -to encourage the employment and use of knowledge specialists. As a result of the policy and the campaign, there is a united voice that has created a greater awareness across the health service about knowledge management and the role of knowledge specialists. 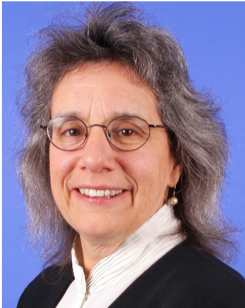 It was with great pleasure that the Knowledge and Information Management group gave the 2018 Walford Award to Sue Lacey Bryant. The award was presented by Dr Ray Lester. The Walford Award has been made for nearly thirty years. Over that time, the criteria have been amended but the award has always been called the Walford Award. So who was Walford? At the 2018 Awards Ceremony Dr Ray Lester, who knew and worked with Dr Walford, gave the following talk. When some fifteen years ago I agreed to become the chief Editor of what became ‘The New Walford’,I had three major concerns: first, whether such a print reference work would still be worth producing in ‘The Digital Age’; second, whether it would be possible to find enough library and information professionals who would be prepared to edit its individual subject sections; but, third, that the Volume I might produce would pay due and proper recognition to the originator of the ‘Guide to Reference Material’on which my Volume would be at least in principle be based. So I suggested as its title ‘The New Walford’ a la ‘The New Grove’ and similar. Albert John Walford, who died in 2000 at the age of 93, was truly a remarkable librarian and person. He left school and worked as a public librarian for about 20 years from 1924, during that time obtaining part time a librarianship qualification from University College London, a BA in History from Birkbeck, and an MA and a Doctorate in Latin American Studies, also from UCL. During the War, he served with the Army in North Africa and Italy, where he was in charge of the Forces Command Libraries. He then worked after the War at the Ministry of Defence, from 1946 to 1973, following that with work at the Commercial Assurance Company in the City, until he finally retired in 1978. He lectured part time at the North Western Polytechnic, which of course later became PNL and then part of London Metropolitan University. He edited the Library Association Recordduring the 1950s. But in the context here, it is his work for and alongside the Library Association Reference, Special and Information Section, founded in 1951, which is especially notable. He began work on what became the ‘Guide to Reference Material’in 1955, producing its first edition in 1959. For that first edition there were some 70 to 80 contributors. The last Edition of the Guide for which he had an overall view was the fifth edition of the Science and Technology volume (by that time the original single volume Guide had expanded to three Volumes), which appeared 30 years later, in 1989 (when I calculate he would have been aged about 82!). 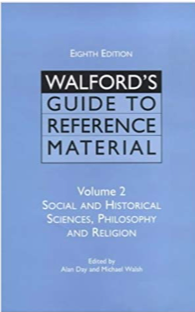 Because of its outstanding quality, “Walford” became the reference work guide of choice worldwide, easily surpassing in quality its US, French and German rivals. Indeed, it has been said that Dr John Walford for several decades was the most well-known British Librarian throughout the world! But John did not just oversee the Guide itself: there were several spin-offs, so much so that for a time, it was only the sales of John’s books that kept Library Association Publishing (the precursor of Facet Publishing) solvent! And on top of all this work from a quiet unassuming man, was Dr Walford’s invaluable contributions to the judging for the McColvin and Besterman Medals. Such contributions in 1991 indirectly led to the foundation of the Walford Medal: instituted ‘to recognise continued and sustained work in the field of bibliography’. 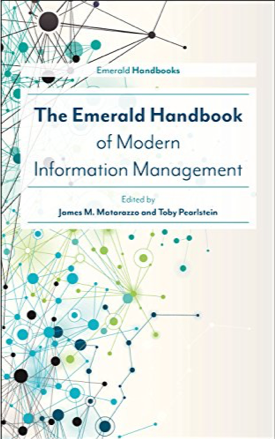 The Emerald Handbook of Modern Information Management is an impressive and authoritative work. Its two editors, James Matarazzo and Toby Pearlstein, are both highly experienced practitioners and theorists. The work intends to capture both the essence and the best practice within the increasingly growing and complex world of information management. 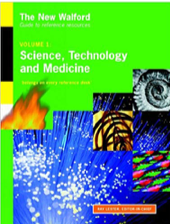 The editors state that whether read sequentially or in topical combinations around common themes, the chapters in this book are meant to provide a construct through which both the practitioner and the student may learn about the major challenges facing them, and also find guidance on how to approach those challenges regardless of the type of organisation in which they work. To achieve this end, the editors have gathered together 38 high quality submissions from experts mainly in the USA and the UK to create an essential tool for anyone seriously involved in the management of information. We are talking about a wide-ranging book, one for people working in public, academic, government and special libraries and information centres. By including all types of libraries from a variety of places, the editors hope to foster the cross-pollination of ideas and practices. 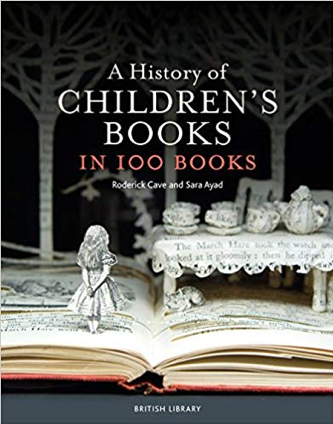 This is a big book; it runs to nearly 900 pages and it is expensive at £150 (lighter and slightly less expensive in the Kindle version), but it is easy to use. It is a must-have tool whoever you are and whatever you are doing in the information field. It is up-to-date, the structure is clear and flows well, there is a comprehensive and useable index and plenty of references for further reading. I could go on describing this major contribution to the literature in our field, but instead I will direct you to the review that Helen Edwards, editor of K&IM Refer, wrote in the Autumn 2018 issue (https://referisg.wordpress.com/) . Read Helen’s article and you will understand completely why The Emerald Handbook of Modern Information Management, published by Emerald Press is essential for anyone seriously involved in the management of information, and why it is awarded the K&IM Information Resources Print Award for 2018. 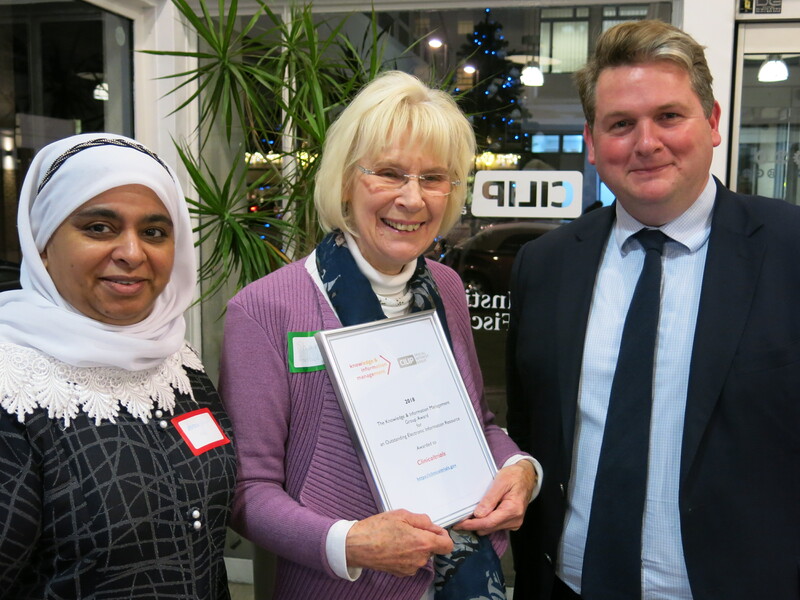 At the Awards Ceremony on 12thDecember 2018, Stephen Phillips and three other UK-based contributors accepted the award on behalf of all the writers and the Emerald Press. 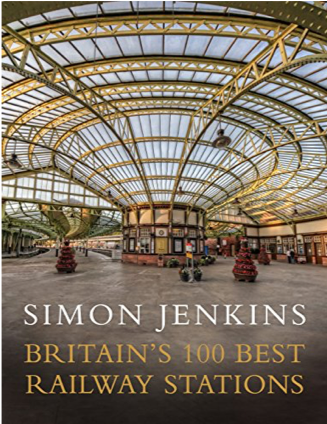 Britain’s 100 Best Railway Stationsby Simon Jenkins, published by Viking Press, and A History of Children’s Books in 100 Booksby Roderick Cave and Sara Ayad, published by The British Library are both examples of superbly produced books. Apart from devotees of their subjects, both books will have a limited use within the knowledge and information world, but they do show how information can be made available both attractively and economically – both cost just £25. The judging panel thought their value should be acknowledged. “Our original pitch to Emerald to create an entirely new Handbook, distinct from the previous eight editions, concentrated on our desire to create a resource that would not only be able to be used as a text to help educate new information professionals, but would also be a pragmatic ready reference covering topics in which current practitioners would find opportunities to enhance their contribution to their organization’s success and/or to the sustainability of their careers. By including all types of libraries from a variety of geographies we also hoped to foster cross-pollination of ideas and practices. We asked each of the authors to create a story arc for their chapter that covered background/history of the topic, how the topic was currently challenging the profession and them in particular, and a case study of how the author addressed that challenge. This was the easy part of the process. Finding almost 40 authors who could help us accomplish this goal was not so easy and keeping them and ourselves on deadline – even more challenging. Jim and I had a system for collaborating, whether it be for an article or for a work of this size. We had the good fortune to live in adjacent towns so spent many a morning at each other’s homes or at a local diner over breakfast working our way through what we hoped to accomplish with each writing project. While there wasn’t a lot of yelling, there was definitely a lot of spirited discussion until we settled on that “hook” around which the publication would develop. For the Handbook we labored over lists of potential authors who could write knowledgeably about the topics we had selected. We sent invitations or called those potential authors we knew personally; not all of our first choices were available to meet our deadline and for some topics the authors didn’t come onboard until several months had passed. In round one of reviewing the manuscripts, we each read them and discussed if they met our expectations. Usually we had to get back to the author more than once with requested changes, additions or clarifications we wanted them to make, which they all were remarkably cooperative about making. Round two was the final read through of each chapter, as well as the materials we wrote ourselves to see if it all hung together. We realized at that point that we had the order of things all wrong and switched the whole Table of Contents around to what we felt was a more “real-world” flow. Each chapter would stand on its own and would also be able to be combined with other chapters as seemed practical to the reader to give them a holistic view of those topics which logically overlapped. About one year into this process, our final role as editors was to read aloud the chapters to each other to double check that everything was understandable, flowed well for the potential audience, and as a whole met our expectations. You can’t imagine how excited we were to learn at this point, that we did not have to reconcile the form of all the footnotes! Emerald assured us their copywriters would take care of this and we breathed a huge sigh of relief. Judging print materials on their relative merits can be difficult, but judging an electronic resource can be best described as challenging. We do use slightly different criteria from the print resources to enable us to judge aspects such speed, reliability, ease of navigation, currency, whether the site is free or subscription-based and whether it contains advertisements etc. Even so, the sites can be enormously different in approach, design and target audience. Some sites have an extremely broad subject coverage, whilst others are highly specialist and deep. And of course the ‘home’ of the resource can be anywhere in the world. www.clinicalTrials.gov falls well and truly into the last two categories. Firstly, it is maintained by the US National Library of Medicine at the National Institute of Health in Bethesda, Maryland. 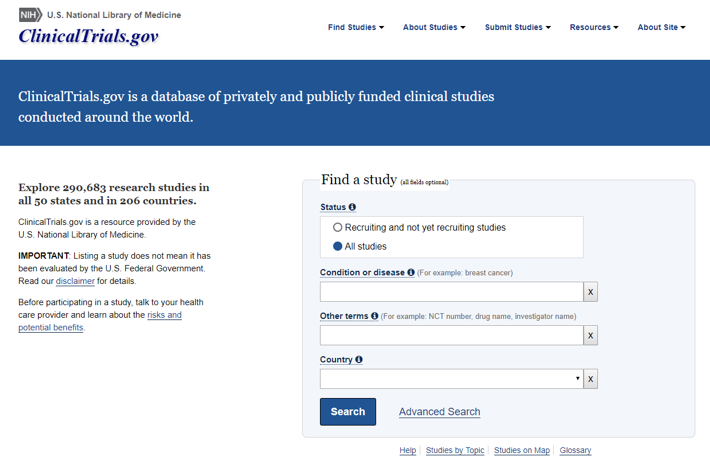 Secondly, it is a complex and specialised resource, being a database of publicly and privately funded medical clinical research studies conducted in the USA and 195 other countries. It provides patients, their families, health care professionals, researchers and the general public with easy access to studies on a wide range of diseases and conditions. There are nearly 300,000 studies recorded, and these can be open or closed studies, those that have reported their results, and those where the results are still awaited. The design of the site is traditional but effective with excellent navigation. The judging panel were impressed by the particularly helpful guidance provided on searching such a complex resource. And also, how to read a study – very useful if you are new to the subject. There is also a glossary and a good FAQ section. Once you have completed your search, you can download data acquired. There are clearly stated quality control criteria, although, of course, this is dependent on the information provided from the sources. This is a unique resource from a highly reputable authority which is updated on a daily basis. To a non-medical person, this database may seem daunting at first, but is just as usable and relevant to them as to any member of the health or medical profession. Its objective is to increase transparency and improve public awareness of research and it does that most successfully. Because the ‘home’ of the website is in the USA, no one was able to accept the award in person. 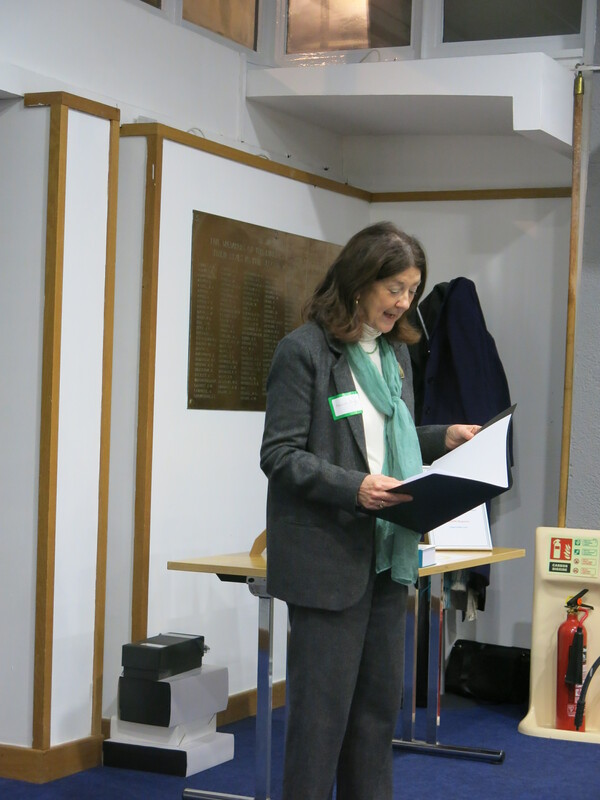 However at the Awards Ceremony on 12thDecember 2018 a short video was shown in which Dr Rebecca Williams, Acting Director of Clinicaltrials, spoke about their pleasure at being given the award. Then Shane Godbolt, formerly Director of the UK-based Partnership in Health Education and an honorary member of the Medical Library Association of America accepted the award on behalf of Clinicaltrials.gov. Once again, the judging panel felt that another of the nominations received should be mentioned. TNA, The National Archives, atwww.nationalarchives.gov.uk, is an incredible site for historians, researchers, genealogists, teachers and students wishing to gain access to 1,000 years of British history from the Domesday Book to the present. As well as their own holdings, there are links to many other sites, many of which, unlike TNA, are paid-for services.